BEIJING/SINGAPORE (Reuters) - Chinese oil trader Unipec plans to resume U.S. crude shipments to China by March after the Xi-Trump deal at the G20 meeting reduced the risk of tariffs being imposed on these imports, three sources with knowledge of the matter said. The sources told Reuters that Unipec - trading arm of state refiner Sinopec is looking to import U.S. oil by March 1, which marks the end of a 90-day negotiating period agreed by the leaders of the world's two biggest economies. China's crude oil imports from the United States ground to a halt in October as this year's trade war between the two countries escalated. "Chinese buyers who want to buy U.S. crude will rush to import the oil during this window," a senior executive from Asia's largest refiner Sinopec said, adding that the oil has to arrive in China before March 1. "Oil prices are low, so it makes economic sense to store some crude as commercial inventories," said the executive, who asked not to be named. Sinopec said it has a policy not to comment on specific trade deals. Unipec did not respond to an email. Oil prices have slumped by around a third since early October amid an emerging glut, triggering expectations that the Organization of the Petroleum Exporting Countries (OPEC) will agree to supply cuts at a meeting this week. It was unclear how much oil Unipec - China's largest crude oil importer - would order from the United States, but one of the sources said the company could lift a record volume of oil in January. China's previous record for a month came in January 2018, when it imported about 472,000 barrels per day (bpd) from the United States, according to Chinese customs data. Before the trade dispute erupted in mid-2018, China had become the largest importer of U.S. crude. China imported on average 325,000 bpd of U.S. crude in the first nine months of 2018 before imports fell to zero in October, customs data shows. 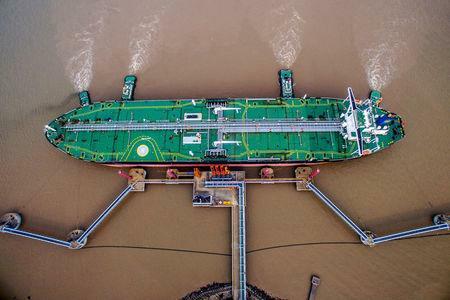 Although crude oil was not included on Beijing's import tariff list, Chinese buyers started avoiding U.S. oil from mid-2018. U.S.-based trade and shipping sources said Unipec is back in the market, looking to buy U.S. crude and book ships for China. Unipec may have chartered VLCC Manifa to load U.S. oil this month, one of the sources said. Another said the company has provisionally booked a VLCC to load U.S. oil in January and make the 45-50-day voyage to China for $8.4 million. While China is expected to maximize U.S. oil imports during the 90-day window, the overall outlook for this trade flow in 2019 remained murky. "Tensions have eased between the two countries but we can't forecast what will happen after March," the Sinopec executive said. "There is a lot of pressure on both sides to reach a mutual agreement in 90 days."